25 November, during this week I have been making my first Vought F4U Corsair for the book, In all I have now finished of no less than 52 Pacifis Fighers for the upcoming book. The first F4U-1A profile of this type is "Big Hog", Flown by Capt. Blackburn in November 1943. 2 December, during this week I have made an additional seven F4U-1 Corsairs for the book, that is to say eight in all, five more will be done before I start on the next aircraft type. 9 December, During this week I made the 12th and final Corsair for the book. Next new profile to be made from scratch is the F6F Hellcat. 16 December, I have been working om Pacific P-40s this week including Capt. John S. Chennaults Alutian machine. At the same time updated some Corsairs, like the well known White 29, the F4U-1A flown by Lt. Ira Kepford. 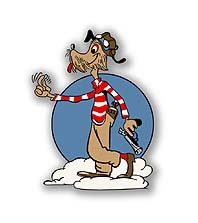 I have also searched for interesting US profile subjects for the book, USAAF fighter-aircraft types such as the P-38, P-39, P-40, P-47 and P-51. 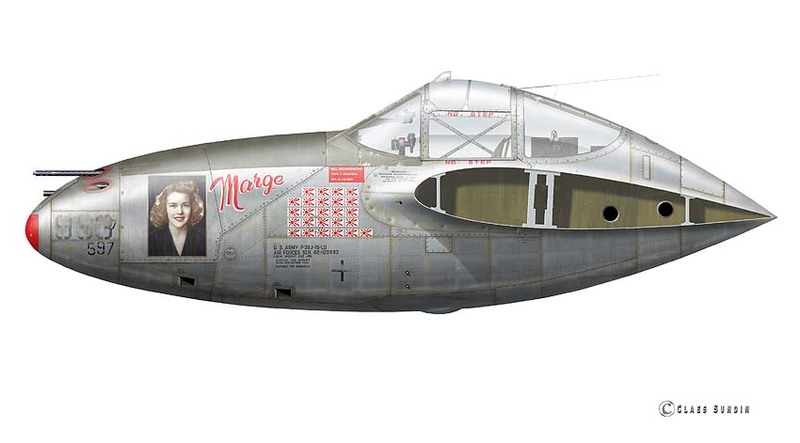 23 December, Today I made my fifth P-38 Lightning for the new book. I guess I have to make another three profiles of this type. The P-38 I made was flown by the highest scoring US ace in WW II, Richard Bong. Please check out the cockpit below! 30 December, after making my eight and final P-38 for the book I started out making a new fighter aircraft type, the F6F Hellcat, making a new original and today I finished of my forth profile. One of the Hellcats made during the week was Lt. Hollis "Holly" Hills machine from VF-32 flown from the carrier USS Langley. A new year! During the week I have made the 12th and final Hellcat for the book, Lt Hiderbrandts "Joan II" below. Today I started of making my first F4F Wildcat original, a profile of this type would be presented here next week. 13 January, after finish my 9th F4F Wildcat for the book I´m back working on USAAF fighter types. Today I have been making a new P-51 Mustang profile. One of the Wilcats I have made during the week was Lt. Noel A. M. Gayler´s machine below. This is a rather interesting profile subject, a well documented machine found on the sea floor last year at 872 meters (2861 feets) depth. 20 January, last week I have been making P-51, P-47 and P-39 profiles for the book, in all 10 new profiles. One of the newly made profiles is the P-47D-20 "Miss Mary Lou" below, flown by Major Harry McAfee from Saipan mid 1944. Next week I will finish off the Allied fighters with another Bell P-39 Aircobra, a Hurricane and a Yak-9U. 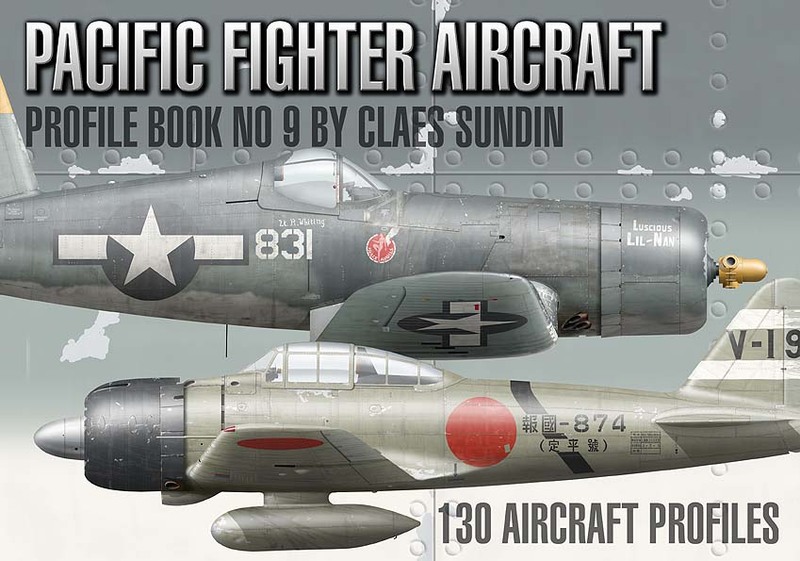 27 January, all Allied fighter profiles is by now made for the book. That is to say that during the week I have made one additional P-39 Aircobra, a RAF Hurricane MK IIb, two VVS fighters from the pacific, one La-7 and a Yak-9U. but also manage to start to work on a new JAAF original, the Ki-43. One of the two profiles of this type made is the one below, a Ki-43-I flown by the top ace Sgt. Saturo Anabuki from the 50th Sentai during the battle for Burma, December 1942. More Ki-43s will follow during the following week. 3 February, All ten Ki-43s are by now made for the book. The next profile original on my "have to make list" is the IJNAF J2M3 Raiden (Thunderbolt). During the week I have manage to make the type and four aircraft profiles, one of the profiles is the Raiden below, a fighter from 352nd Kokotai with two Thunderbolt flashes on the fuselage sides. My plan is to make another 4-5 aircraft profiles of this type before I get going on the next Imperial Navy type, the N1K2-J Shinden-Kai. A type I hopefully would "show off "a week from now. 10th February. this week I have been made the final four Raiden fighters and seven of a new profile type, the Shinden kai. One of the new profiles this week is the well know profile subject of Lt. Naoshi Kanno presented below. Kanno one of the many fighter aces in the elite 343rd Kokutai of the Imperial Navy and he led the 301st Hikotai up to the first of August 1945 when he was KIA. Next week I will tweak my 25 + Zero fighters and make a few new ones as well of this type, especially Zeros from the 1943-44 period. 17th February, this week has been a productive one. When I started to make this book I have already made 25 A6M´s just for fun. However as my aim is to to include all major battles of the Pacific Air War, trying to get a well balanced narrative I have to exclude half of them and make eleven new A6M Raisen´s (Zero´s). One of the newly made profiles is the A6M3 Model 22 Reisen below, flown by the ace Lt. Takeyoshi Ohno from 251st Hikotai. I have also uptated my Ki-84s and My Ki-44s, 12 profile in all. Finallc I have started to write the profile texts for each and every profile. 3rd March, A new month that would be filled with writing the captions to the 130 profiles that I should include in my new book. After a weeks work I have manage to write one fifth of the texts, longer and with more sustance than before. Looking great to far. My plan is that by the end of the month they would all have been written. 10 March, another week filled with writing captions. Today I have manage to write the last of the Japanese fighters captions, in all 64 texts, that is to say 37 full A4 pages with profile captions. Tomorrow I will start write the first of 66 Allied fighter captions. 18 March, a week filled with Allied caption writing and I have manage to write 28 texts in all. During the followning week I should manage another 30 or so. Please note the book cover below. 24 March, The last week I have written 23 more Allied Aircraft captions. By other words I have 15 more to write befor I start on the Pacific War chapter. 31st March, During the week I have made all the profile captions for the book, in all 130 texts filling 81 A4 pages. That is to say more text material in this book than ever before. 7th April, This week I have been making the illustrations for the book, in all I have made 82 inllustrations including the USN VF-16 badge below. Next week I would make the final 20-25 illustrations for the book. 14th April, as all illustrations, profiles is by now made and all texts are written I´m currently working on the layout of the book. Then there will be some editing and re-edeting before I send the book over to the printer, hopefully during the end of this month.